I figured since I did ok at K-Mart yesterday I would try my luck over at Target today. I am not going to tell you that I didn't even open yesterdays stuff yet. I was going to the mall to have lunch with a friend and I was like, "oh, why don't we park up by Target?" She knew why and she complied with my request. We had lunch then stopped back on the way out. They only had 2009 Heritage and First Edition blasters. There were packs of 09 F.E., and that was it other than the Attax cards. I saw a few random Timeline packs, and I opted to get one of those since I haven't had bad luck with opening them. 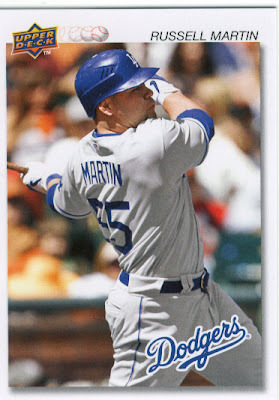 I ended up with a Russell Martin card I don't think I have, and pulled a jersey card as well. 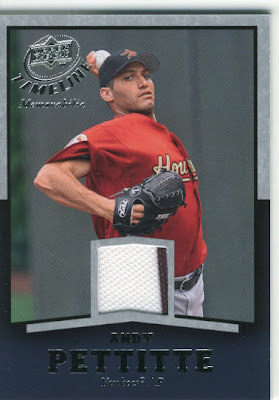 As soon as I opened the pack and saw that it was Andy Pettitte, I looked at my friend and said, "Suzy just got a sweet card." It's nice to get a card with a stripe on it, or dirt which is what I like seeing. I feel like when a jersey comes with dirt, you know the player or some player actually wore it. Unless the companies rip things off shelves and throw them on the floor. The other 2 cards in the pack were Manny and Corey Hart. I'm going to open some stuff later, after I log in a pile that is on my desk collecting dust. YOU PULLED A PETTITTE JERSEY?!?!?!?!?!?!? ARGHH!!!! I wish I could tell you how many blasters I went through to get that card, only to pull some garbage jersey. I love jersey stripes and I had a Wal-Mart day. WOOHOO! Funny how you pull an Astros Pettitte jersey with a pinstripe...very fitting. I still can't believe he was an Astro. Can you tell me where this Target is located? Did it really only have two different blasters? So Sooz, any desire to trade the Pettitte Timeline for a Jeter jersey card you don't have?? Maaaaaaaybe. What card is it? Ummmmm... dunno. I'll take a look at what I can part with when I get home tonight. I have a handful of other Jeters set aside for you too - ones I didn't see in your Beckett collection. What I think I'll wind up doing is mailing them along with the cards I have aside for Marie in one package, because I'm cheap. Even if we can't work something out for the Andy, I'll get them out to you in a couple of days!